Victoria is Canada’s destination for year-round outdoor adventures on both land and water. It has easy access to endless scenic trails and sites that incorporate mountains, old-growth rainforests and rugged ocean shores. 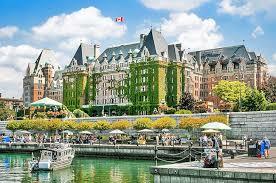 If you are a globe-trotter and looking for a new destination to add to your checklist, Victoria could be the answer for you. MOUNTAIN BIKING: Victoria’s mountain biking areas are covered with trails for riders of all levels. Try the trails at Bear Mountain, the official year round training ground for Cycling Canada’s National Mountain Bike team. Book on to a cycling camp to enhance your skills or rent gear and ride on your own. Alternatively, hit the trails with a local guide and find different trails around the region. HIKING: It’s easy to access hiking trails only kilometres from downtown Victoria. Hike to the top of Mount Douglas for panoramic views of the Olympic Mountains and Victoria below, or drive to Goldstream Provinicial Park and find the historic wooden railway trestle. Head out to East Sooke Park and walk the coastal forest trails. Keep an eye on the ocean, it’s often possible to see eagles and whales if you’re lucky. WHALE WATCHING: The clear waters surrounding Victoria are home to an abundance of marine wildlife, making them perfect for whale watching. The orca, or killer whale, is the main whale found in the area. Gray, humpback and minke whales are also often sighted. See these majestic mammals up close with one of the city’s many whale watching companies. Most tours launch from the Inner Harbour. KAYAKING AND SUP: Equal parts peaceful and exciting, one of the greatest ways to experience Victoria and Vancouver Island is by kayak or SUP (stand up paddleboard). Head explore the Inner Harbour from a different vantage point, or paddle the calm waters around Brentwood Bay and Tod Inlet. Local kayak outfitters provide rentals and lessons along with full day and overnight adventures.